Are you a big Transformers fan? Discovery Family just announced their new TV show, Transformers: Rescue Bots Academy, will debut in January. Transformers: Rescue Bots Academy premieres on Discovery Family on January 5th at 9 a.m. ET/PT. (Miami, FL) – It’s time to roll to the rescue! Today, Discovery Family announced TRANSFORMERS: RESCUE BOTS ACADEMY, an all-new 52-episode animated series for viewers in preschool produced by Allspark Animation, a Hasbro Company, premiering Saturday, January 5 at 9a/8c with two back-to-back episodes. New 11-minute episodes of the series will stream live on Discovery Family GO and will also be available on demand the following day. Additionally, beginning Saturday, December 29, viewers can catch a special two-part pre-premiere on Discovery Family GO. 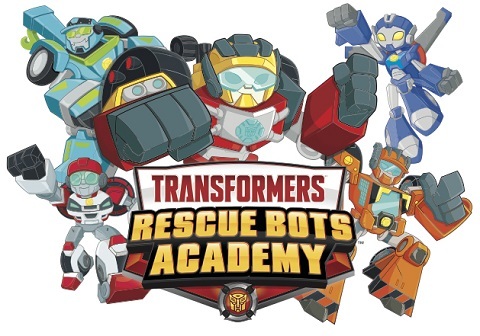 School is in session in the world of TRANSFORMERS: RESCUE BOTS ACADEMY and instructors Heatwave the Fire-Bot, Chase the Police-Bot, Blades the Copter-Bot, and Boulder the Construction-Bot are ready to train a new batch of recruits. Just arriving on Earth from their home world of Cybertron, young Hot Shot, Hoist, Whirl, Wedge and Medix have the honor of being the first class in history to enroll in the Rescue Bots Academy, a highly advanced training facility located at a top-secret base. With encouragement from Optimus Prime, Bumblebee, and Grimlock, the new recruits learn the power of team building through exciting simulated and real-life rescue missions that highlight the importance of heroism, teamwork, and most importantly, friendship. In the back-to-back series premiere titled “Recruits,” Optimus Prime builds a new team of young Cybertronians to train as first responders at the Rescue Bots Academy. However, the rigorous training takes a toll on new student Hot Shot and he soon learns that being a hero is easier for some than others. Trying to find his place on the Rescue Bots Recruits team, Hot Shot discovers the importance of working together in order to save the day as one of Earth’s youngest heroes. What do you think? Are your kids into Transformers? Will they watch this new series? More about: Discovery Family TV shows: canceled or renewed?, Transformers: Rescue Bots Academy, Transformers: Rescue Bots Academy: canceled or renewed? Love Chicago P.D. and Chicago Fire. DO NOT TAKE THEM OFF. I was born and raised in Chicago. Just wish they would have left Olinsky on P.D. And please get Hank a girlfriend so he seams more human instead of a maniac.